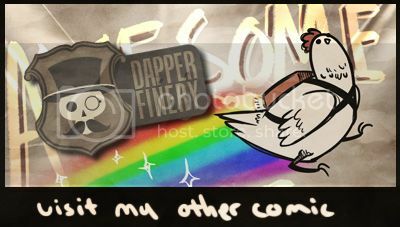 Been a while, I updated Dapper Finery (journalish things). Scout and Motokool will be updating this week, too So… things. At Just the right time for Everyone to walk in, from family to doctors concerned about the noise. aren’t tiger sharks actually fairly moderate in size compared to humans? Jesus Christ, his face. It’s almost better than Nergil’s a few strips ago. YAAAAY! FINALLY! Motokool upd. i’ve been waiting for so long! WНУ?! WНАТ did i dо wяоиg? I’m guessing your excitement for the UPCOMING update made them think there was an update NOW. All the more reason to read Scott’s little blurb that comes with each comic post. He usually tells us that there is a an update, or in this case, an upcoming update. I think, based on the fact this apparently happens “about once a year”, they’re only counting more recent scars. It’s probably confined to scars picked up in the last 20 mins. *turns to show claw scars on his back* Conceiving your daughter. I have missed Dapper finery!!!!! Am I the only one who expected him to be a bit more………..Ripped? Still. You’d think that as a result of the bears, he’d gain a bit more muscle mass. Or for that matter, hair. Pffft. Who needs muscle or hair. Out of curiosity, what days does Nerf This update on? I found someone who was shown in a similar situation, but ill-equipped to survive it. I do not see any angry veins. Not even on the rage-stache. …I am so disappointed.